Copyright 2012 Nova Science Publishers Inc. Recently, interest in multiple-unit iterative combinatorial auction games has increased. In these auctions bidders are able to combine different items and also offer different quantities of individual items. Providing feedback on implied current prices using results from intermediate rounds facilitates bidding. 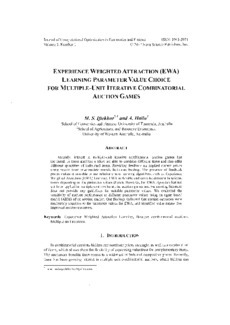 The presence of feedback prices makes it possible to use relatively new learning algorithms such as Experience Weighted Attraction (EWA) Learning, EWA is flexible and can take different functional forms depending on the parameter values chosen. However, the EWA algorithm has not yet been applied in multiple-unit combinatorial auction games and the exisitng literature does not provide any guidelines for suitable parameter values. We evaluated the sensitivity of auction performance to different parameter values using an agent based model (ABM) of an auction market. Our findings indicated that auction outcomes were moderately sensitive to the parameter values for EWA, and identified value ranges that improved auction outcomes.